Home » A Turk in a Pelise. 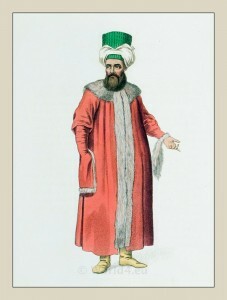 Ottoman man in a fur coat. THESE robes, called pelises, are now very generally worn in Constantinople. The common artificers, soldiers, and countrymen, not only have pelises of lamb or sheep skins, of the furs of cats, or squirrels, &c. which they wear in winter, but also made of the skins of wild foxes and hares; the latter are generally worn by the common citizens; the price of these varies according to the color, quality, and length of hair. The ermine, the common marten, the white fox, but particularly the sable, are found in the wardrobes of rich and distinguished people. The Turks very often change their outside habits, at different seasons of the year, and it is never the business of fashion, but etiquette, to assume, or leave off, the various robes. The days are fixed every year by the Sultan. The day he changes his sort of fur, which is generally on a Friday, when he goes to the mosque, an officer of the seraglio goes in form to the Grand Vizier’s, and acquaints him of it: when the whole Court immediately do the same.